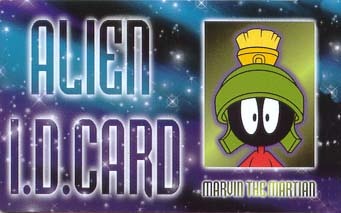 Marvin and K-9 get to see the greatest and trendiest hot spots in the galaxy when Marvin flashes his Martian ID card. If they ever run into a bit of trouble accessing anywhere, they will resort to using one of the weapons listed below...no arguments! The Illudium Pu-36 Explosive Space Modulator is Marvin's weapon of choice. He uses it to threaten Bugs Bunny, Duck Dodgers and all of us Earthlings! He fought to claim Planet X at the same time as Duck Dodgers, for it's rare source of Illudium Phosdex (the shaving cream atom). Perhaps it generates the energy needed for Marvin's Illudium Modulator? Hear Marvin say what is weapon of choice is. Click here! The Martian Maggot (at right) is the spaceship that Marvin and K-9 use. It is a reliable ship that has taken them on millions of miles of intergalactic travel and is quite economical, especially when making those long trips to obtain the last of the Illudium Phosdex! These creatures are always handy for dealing with meddling bunnies and other Earthlings.